Think of the excitement that comes when it’s time to go kayaking. But there is one aspect that can take away the excitement; how you transport your kayak to the water? This is especially challenging if you live miles away from the water or when you have multiple kayaks. That’s where a kayak trailer comes in. A kayak trailer makes kayak transportation effortless. In this article, we take you through what to consider when buying or upgrading a kayak trailer and also present some of the best kayak trailers from reputable brands like Malone Auto Rack. Malone Auto Rack, a renowned manufacturer of a variety of sports trailers and accessories, have the best options for water sports lovers. 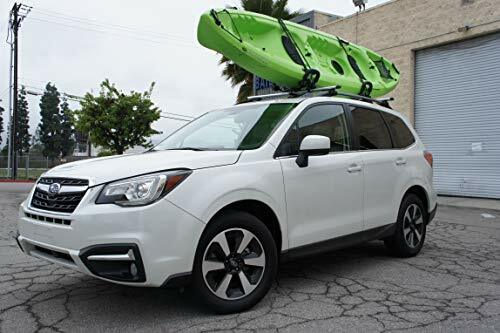 In fact, their gear is specially designed to mount vessels to vehicles, enabling one to easily and safely transport their kayak or kayaks on the road. Space utilization is one of the greatest benefits of this kind of trailer. Since it sits on top of the car, it can effectively fit into most places that the vehicle passes through. This eliminates the need to remove your rack when storing the car in a small garage. In addition, you do not have to worry about being extra cautious when taking a turn or passing on the road, since there is little or no additional extension to the length of the vehicle. Moreover, roof rack trailers adopt a simplistic design that is easy to install. One can quickly adjust and secure the clamps in just a matter of minutes. In terms of purchase price, roof rack trailers also score well. Because of less material required to build them, they tend to be cheaper than the tow behind models. Whereas some jurisdictions may impose additional taxes or laws regarding the use of tow behind trailers (such as requirements for working lights and separate insurance), roof trailers are rarely affected by such laws. A major drawback of this type of trailer is its impact on the vehicle’s stability and fuel efficiency. An automobile becomes more unstable when you place a large weight on its roof, making it unsafe to drive it at high speeds. In terms of fuel efficiency, roof trailers are also a letdown: The streamlined nature of small vehicles normally allows them to minimize atmospheric drag, thereby reducing the amount of effort the engine needs to accelerate. When you add a rack to the top of the vehicle, however, it interferes with the original shape, which may cause wind resistance and cause more stress on the engine, making the car consume more gas. In addition, while roof racks do not face horizontal space limitations, drivers may not be able to use certain parking spaces that have height limits. Poor mounting points in some models of roof rack trailers may also cause dents to the vehicle or scratch the paint. It might also be difficult to carry and place heavy loads on the top of the vehicle. These trailers are a good choice when one is trying to overcome the limitations faced by rooftop trailers. Although they may be difficult to fit in smaller spaces, they have enough vertical space to carry sometimes four or five kayaks at a time. Fuel efficiency in tow behind trailers is also favorable. Because they are behind the vehicle, they do not interfere with the car’s aerodynamic profile. Moreover, these trailers do not affect the center of gravity of the vehicle even when loaded, hence ensuring that the vehicle retains its stability at higher speeds. The loading process of these racks is also often easy. Unlike in roof racks where you have to lift your kayak to the top of the car, the trailer bed is low enough for you to easily place and secure loads. One disadvantage of these trailers is that they add an extension to your vehicle, requiring you to create longer arcs when taking corners, reversing, or overtaking. There is also the risk of jackknifing and damaging the rack and its contents. Secondly, tow-behind trailers are rather expensive, mainly due to their high material costs. You might also have to consider the legal issues surrounding the use of trailers in your region before buying one. Some jurisdictions, for instance, levy additional taxes, require periodical inspection for trailers, or demand for separate insurance policies for them. 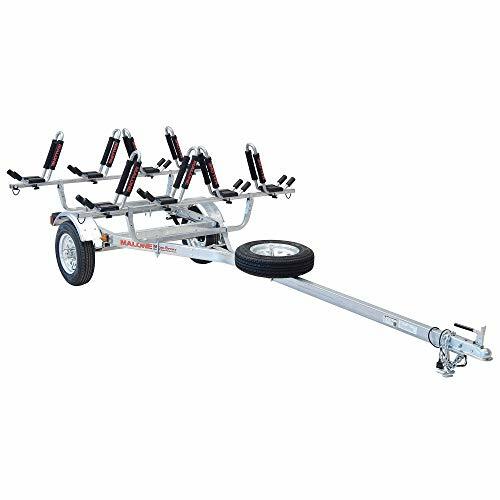 You might have to assemble the trailer on your own using the instructions on the manual if you are buying a tow trailer online. Although the assembly process is straightforward, it takes a lot more time to assemble as compared to mounting a roof rack. 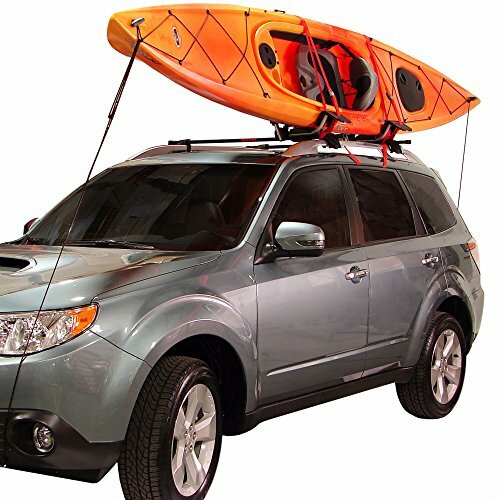 Although space is an issue with most roof rack kayak trailers, manufacturers like Malone have found an ingenious way to create extra space through their unique designs. Malone’s proprietary V-Style and J-style design ensure that your kayak doesn’t occupy all the space on the roof, allowing you to carry other things too. The styles are also good for keeping your vehicle streamlined. While unique in their own way, the parts of Malone products adhere to international standards. This ensures that your rack fits onto your car and is easily secured. Strength is a crucial aspect of any trailer. Consider buying not only a tough trailer but also one that doesn’t corrode, especially in salty and wet environments near the ocean. A non-corrosive component like galvanized steel is also important if you are going to be keeping your trailer outside. Malone is committed to constantly innovating and upholding the high standards of sports trailers. 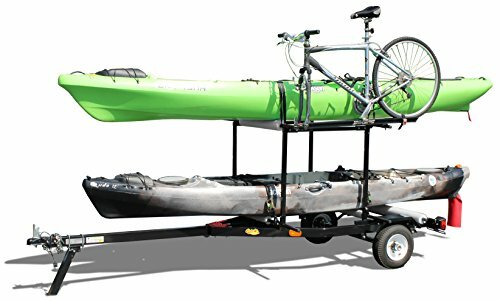 The Right-On Multi-Sport Multi Rack Kayak Trailer is an all in one, tow behind trailer that can carry more than one kayak, bicycle, and other equipment in one trip. The 212-pound trailer comes with standard tongue stand and 64” wide crossbars that are standardized to complement existing accessories from other manufacturers. It has a very stable body with a ball to axle distance of about 10 feet. The very spacious MicroSport Trailer Kayak Transport Package has a sufficiently low bed to ease the task of lifting loads. Its J-Pro2 Kayak Carriers can support up to four kayaks. The multi-trailer also features a 78”x164” frame made of pre-galvanized steel and safely carries loads of up to 350lb. 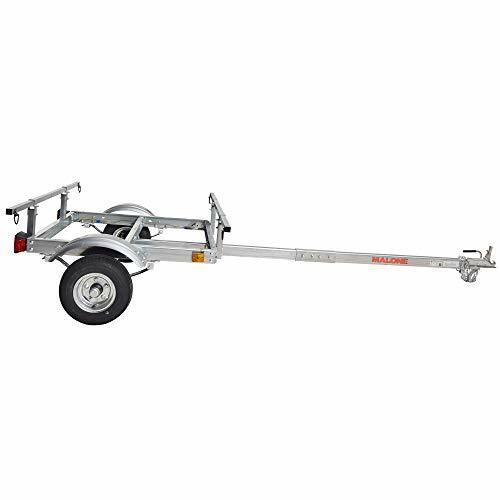 If you are looking for a super light trailer that can carry a canoe or kayak of 14” long, the Malone Xtra Light Base trailer is something you should consider. The Base trailer has a weight rating of 275 lbs, thanks to the strong galvanized steel frame and its steel-coated bars. The DownLoader Kayak Carrier is one impressive roof carrier that emphasizes on strength while offering the needed protection for your kayak. To ease the loading process, the carrier adopts a fold-down technology and is compatible with load assists such as Telos. It also has versatile Jawz mounting hardware that eliminates difficulties in fitting it to a standard square, oval, or round cross rail. Its strong frame, which measures 19.5” high, 6” wide, and 17” long, carries a load capacity of 75lbs. For those who love the color, the DownLoader’s multi-color design offers a good for visual appeal. The RoofTop Universal Kayak Carrier is one of the cheapest and most flexible Kayaks trailers in the market. It is also a good bargain with a weight rating of 75lbs. Apart from locking your kayak to a strong frame, the adjustable padding eliminates the risk of damage during movement. In addition, the carrier has J-bars that easily fold to allow parking in a small garage; so you don’t have to remove the carrier once mounted. Buying a suitable kayak trailer will largely depend on a person’s needs. However, factors like durability, compatibility, good carrying capacity, and safety are everyone’s preferences. Malone Auto Racks focuses on providing products that meet all these while still keeping their trailers affordable.